Four Seasons Yacht Charter began with just one yacht but due to demand, the fleet has expanded and varies each year. As a family run business with a passion for sailing, we aim to provide a personal service tailor-made to meet your needs and maximise your sailing enjoyment. 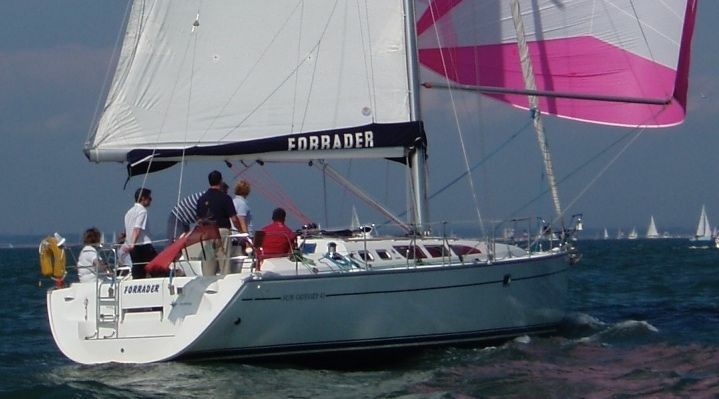 Unlike many other charter companies, we do not charge extra for the use of a spinnaker or for normal use of fuel and gas; hidden extras that we know are unwelcome. Please call us on 02392 511789 for a quote, in most cases Mark the proprietor will answer the phone and will endeavour to give the best possible advice for your chartering requirements. With many returning clients our testimonials prove we provide a professional approach. Mark has been in the marine industry for over 30 years either selling chandlery, repairing yachts or chartering yachts. He has over 50,000 sea miles including both inshore and offshore racing at a very competitive level including 4 RORC Fastnet’s, jog inshore and offshore series wins and the Atlantic ARC rally including the trip to Gran Canaria. Known to be good-natured and easygoing, Mark thrives on seeing people enjoying their sailing. Since 2014 he has been joined by his wife Ella who is also a keen sailor competing both inshore and offshore having 2 Fastnet’s under her belt! Ella comes from an accounts, sales & marketing background and can also be seen at the Marina making sure your yacht is appropriately equipped and ready for charter. Our Skippers are all picked for their people management skills, humour and attitude towards skippering a safe yacht. Please let us know if you want a ‘salty seadog’, a ‘lady’ for those all girl crews or just an all round ‘good egg’! To meet demand we now have a Polish speaking skipper. Our Skippers have Commercial Yachtmaster certification which includes having attended a sea survival and first aid course in the unlikely event that you require either of those skills. Est 1999..... Why Four Seasons Yacht Charter & Sailing Sea School? © Four Seasons Yacht Charter Ltd. All rights reserved.